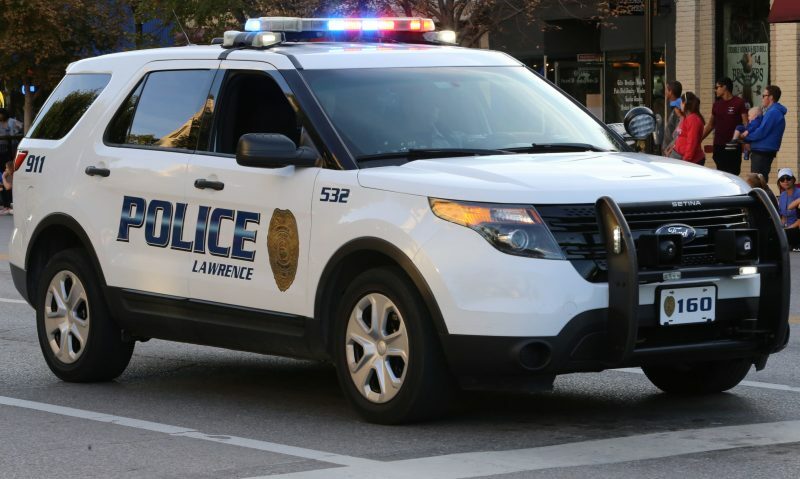 Police shot a man during a traffic stop that escalated into an altercation at a busy intersection Tuesday afternoon in downtown Lawrence, the Lawrence Police Department said. The person who was shot was taken to a hospital and was in stable condition, Lawrence police Capt. Anthony Brixius said. At 5:03 p.m., a Lawrence police officer conducted a traffic stop on a westbound SUV in the 100 block of West Sixth Street, Brixius said. The location is between Vermont and Massachusetts streets, next to Robinson Park, directly south of the Kansas River bridges. At 5:09 p.m., the first officer called for assistance and was in distress, Brixius said. “A second officer arrived on scene, and from what we know at this time, there was a struggle going on between the officer and the person involved,” Brixius said. Brixius provided some preliminary information about the incident during a media briefing at about 6:30 p.m. at the scene. Brixius said a knife was recovered at the scene, but he did not know whether the knife was involved in the altercation. Brixius said he could not confirm how many officers, if more than one, fired their weapons. He said he also could not confirm whether the person shot was the driver of the SUV that was pulled over, or whether anyone else was in the vehicle during the incident. 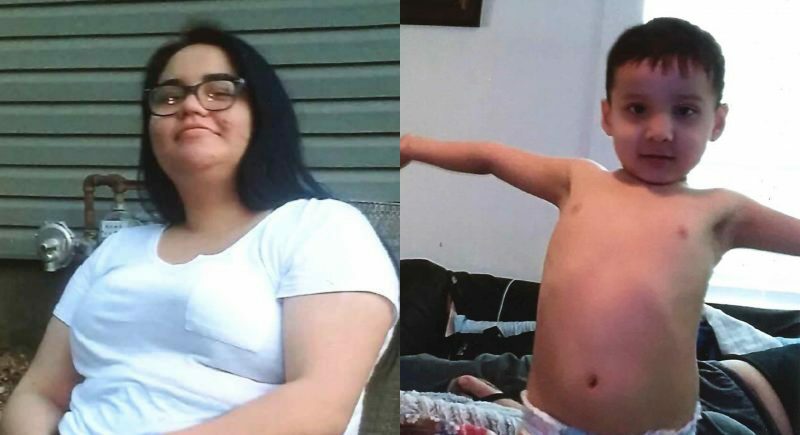 As is protocol in officer-involved shootings, an outside law enforcement agency, the Johnson County Sheriff’s Office, will be leading the investigation into the incident, Brixius said. 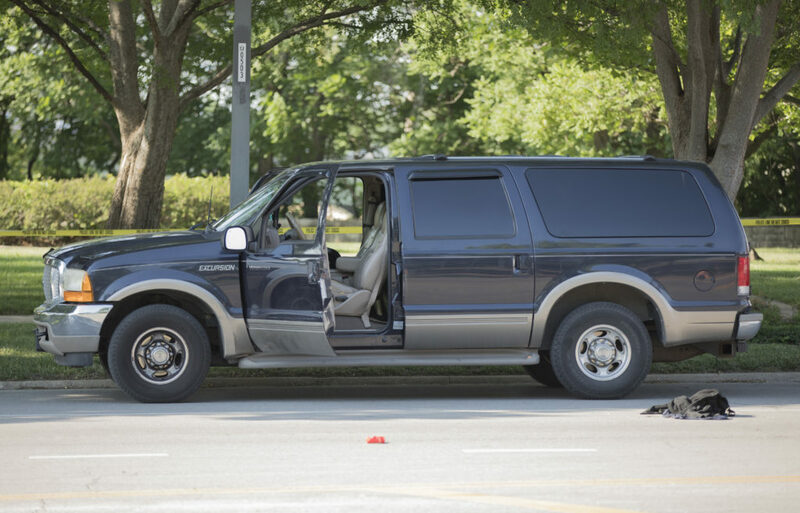 A Journal-World reporter at the scene minutes after the shooting saw the SUV stopped in the far right lane of westbound Sixth Street with both front doors open. Two Lawrence police patrol vehicles were stopped behind it, one in front of the other, also in the far right lane. A black man was lying in the street next to the SUV. First responders loaded him onto a gurney and into an ambulance. A Journal-World photographer saw what appeared to be at least one shell casing in the street next to the SUV. 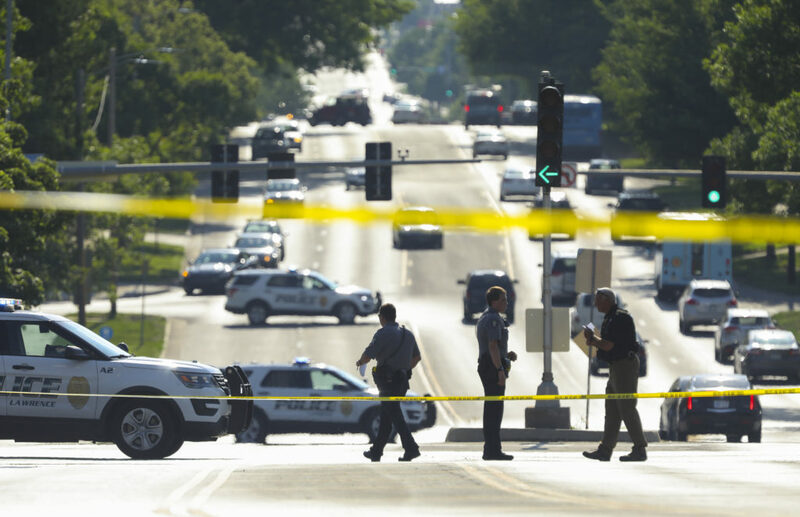 One eyewitness, who said the shooting happened directly in front of his car as he was stalled in traffic on Sixth Street, described what he saw to the Journal-World. He asked that his name not be published, as the matter involves an ongoing investigation of an incident that is sensitive in nature and he is concerned about potential ramifications for him and his family. 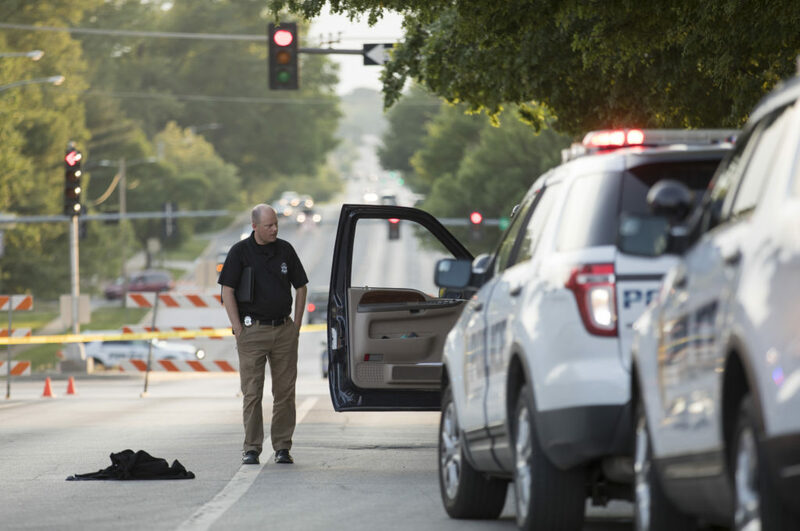 The man, who works in downtown Lawrence, said he had been interviewed by both Lawrence police and then Johnson County sheriff’s investigators Tuesday evening. The man said he was westbound on Sixth Street and had just driven through a green light at Massachusetts Street when traffic slowed and he came upon the SUV. He said at that time, there already were two patrol vehicles on the scene, but he did not see obvious signs of a struggle. He saw that the driver’s side door of the black SUV was open and a police officer was standing next to it. He said the officer had his right arm leaning on the SUV between the front and rear doors, and his left arm resting on the open door. The man said he could not hear the interaction but that it appeared casual, and he did not see anything like aggressive body language or flailing arms. 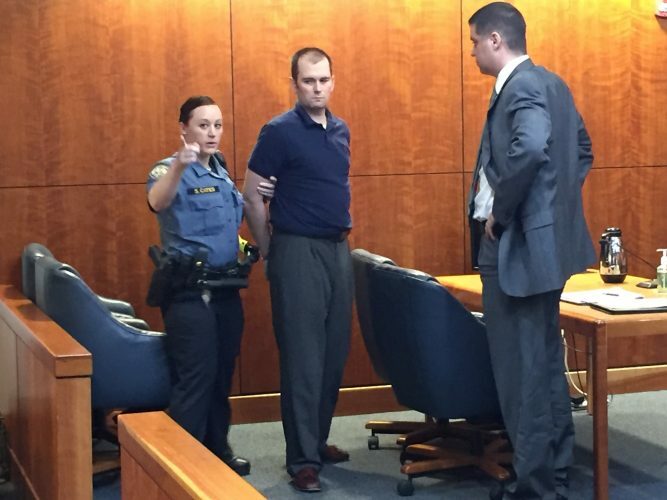 They tumbled to the ground — the driver said he couldn’t tell if the officer stumbled or was pushed — and fell right in front of the witness’ car, where he could not see them. The man then saw an officer run from the direction of the second patrol vehicle to within feet of the men on the ground, and pull something from her belt. “Then there was a loud pop,” the witness said. It was a matter of seconds, probably less than 10, from when the driver jumped out of his car at the officer and when the second officer fired, the witness said. He said law enforcement and medics soon swarmed the area, and he was unable to see what happened next with the officers and the man in front of his car. The man said he did not see a knife, but that the incident happened so quickly, that he couldn’t say with certainty that there wasn’t one. A detective with the Johnson County Sheriff’s office walks around a Ford Excursion that was driven by an individual shot by a police officer at the intersection of Sixth and Vermont streets on Tuesday, May 29, 2018. A woman who was in a nearby business said she heard one gunshot and then sirens, but did not see the incident. Several other people on the sidewalk shortly after the incident said they did not see what happened. 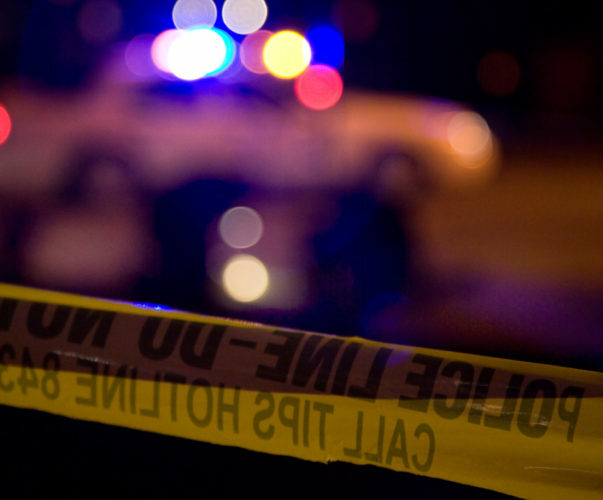 Sixth Street was closed between Massachusetts and Vermont streets, and remained barricaded into the evening as law enforcement continued investigating the incident. Johnson County Sheriff’s Office representatives began arriving at the scene by 7:30 p.m. Investigators were taking photographs and had placed at least four evidence markers near the SUV by 8:30 p.m. One marker was in the grass near the front end of the vehicle and three were in the street on the other side of it, including one marking what appeared to be an article of clothing. Lt. Paul Nonnast, public information officer for the Johnson County Sheriff’s Office, asked anyone with information on the incident to share it with investigators by calling 785-843-0250.